When you are searching for a good coffee machine, you can be sure that you will have a tough choice ahead of you. Not only each brand has a lot of different models as there are many different brands to choose from. 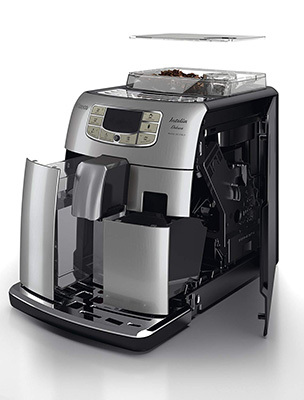 So, how can you make sure that you pick the best coffee machine for you? The truth is that you need to take a closer look at what each coffee machine delivers and then think about what you prefer. While for some people the ability to get the best espresso is enough, others may require a machine that also makes cappuccinos or lattes, for example. 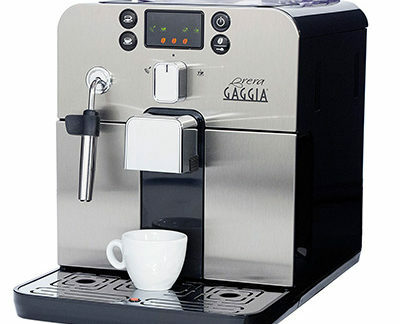 So, today, we decided to write our own Gaggia Brera review. The truth is that you probably never heard about the brand before. So, we’re taking a closer look to see what you can expect from the Gaggia Brera. Featuring a stainless steel front panel, the Gaggia Brera will look good on most kitchens. While some coffee machines are made entirely of stainless steel, this isn’t the case of the Gaggia Brera. In fact, it does include some plastic parts. When you are looking at the Gaggia Brera, one of the things that usually tend to catch users attention is the control panel. In the case of the Gaggia Brera, you can expect to get a control panel that is not only intuitive as it is also pretty simple. 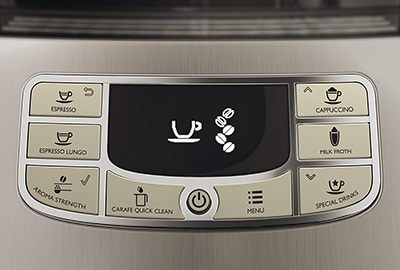 In case you decide to buy the Gaggia Brera, you need to know that you’ll be able to adjust the coffee strength, the water quantity, and to select the mode. 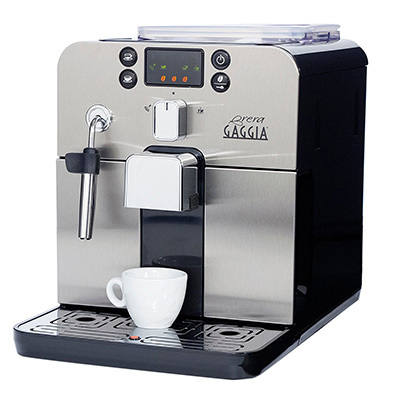 The Gaggia Brera includes a ceramic burr grinder that is located on the top. In case you like to be in control of your coffee beans, you will be glad to know that you can adjust the coarseness level that you prefer. In case you like to change your morning drink or if more family members are going to use the Gaggia Brera as well, you will like to know that the Gaggia Brera allows you to make lattes and cappuccinos as well. After all, the Gaggia Brera includes a rapid steam pipe that only takes 9 seconds to heat up. Are you looking for the best coffee brands? One of the things that we really like about the Gaggia Brera is the fact that you can use both coffee beans as ground coffee. Besides, and in what concerns customization, you can easily choose to have a decaf, adjust the coarseness of your grinder by changing the knob, determine how strong you want your espresso to be (between 3 options), and you can even choose between an espresso and a long coffee. If there is something that we would improve in the Gaggia Brera is the clean easiness. The reality is that the Gaggia Brera requires some regular maintenance such as cleaning the brewing unit. 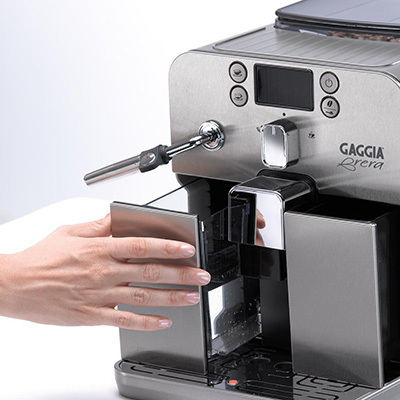 Overall, we like the Gaggia Brera. Both the espressos and cappuccinos are pretty great and we love the fact that the Gaggia Brera is versatile enough to allow you to use both coffee beans and coffee ground. In addition, we also like the options that it offers in terms of the grinder and in terms of the strength of the coffee. However, we have to say that we would prefer that it could be easier to clean and maintain. The truth is that when you compare the Gaggia Brera with other coffee machines, the Gaggia Brera requires higher maintenance. When you are looking for a good coffee maker, you need to consider Hamilton Beach coffee makers. The truth is that this brand is very popular not only because it delivers high-quality coffee as well as they tend to be quite affordable. So, they end up being a great solution for people who need to have a good cup of coffee to wake up in the morning. As we said, Hamilton Beach has different coffee machines. 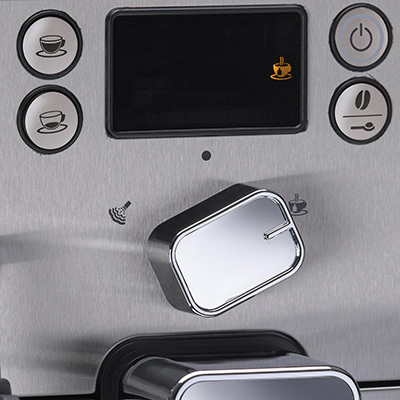 And today, we decided to take a closer look at the Hamilton Beach 48465 Coffee Maker. Featuring a stylish and modern design, the Hamilton Beach 48465 Coffee Maker has a 12 cup capacity which is perfect when your family loves to have a good cup of coffee as you. 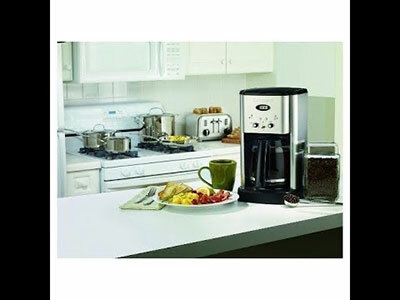 In addition, the Hamilton Beach 48465 Coffee Maker is also great when you have guests at home. One of the things that you need to know about the Hamilton Beach 48465 Coffee Maker is the fact that this coffee maker works as a drip coffee machine. And now you are wondering where the carafe is and we need to say that the Hamilton Beach 48465 Coffee Maker doesn’t need one at all. 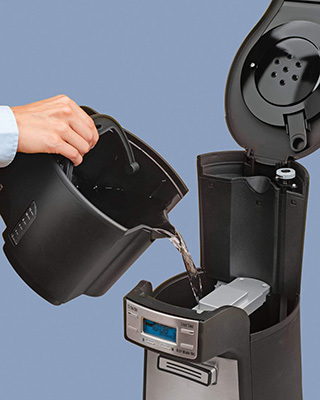 The Hamilton Beach 48465 Coffee Maker features a different design in which this coffee maker is able to hold the coffee inside in an internal tank. This is why you don’t see a carafe and you don’t need to buy one either. Discover the best thermal coffee makers. 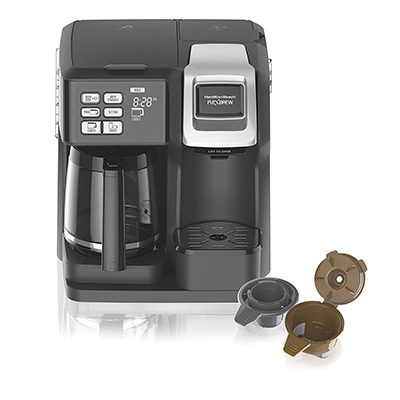 The truth is that there are a lot of coffee lovers happy with the Hamilton Beach 48465 Coffee Maker. After all, this coffee maker allows your coffee to remain hot up to 4 hours. And the only way they had to do this is because the Hamilton Beach 48465 Coffee Maker doesn’t use any hot plate or an external carafe as other drip coffee machines. As you already know, it conserves your coffee in perfect conditions in the internal tank. 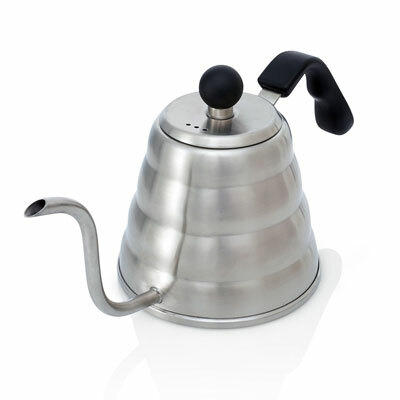 Check out other drip coffee maker machines. 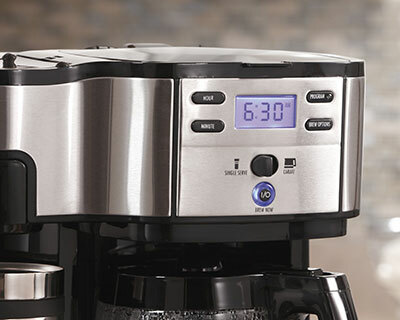 One of the things that we particularly like about the Hamilton Beach 48465 Coffee Maker is that it allows you to fully customize the settings so that you can have a cup of coffee just the way you like. The controls are easy and intuitive and you can choose between several brewing options that include small batches, regular, bold, and even iced coffee. 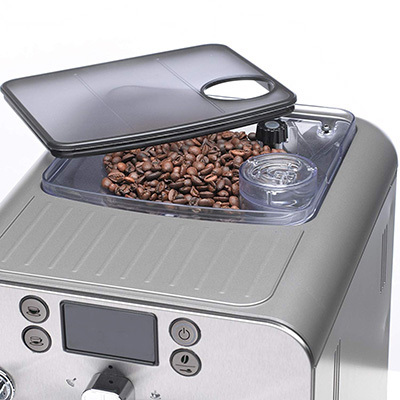 So, as you can see, the Hamilton Beach 48465 Coffee Maker is incredibly versatile. 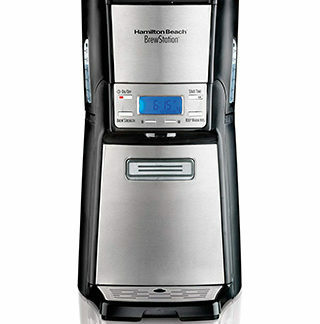 Make sure to read our Hamilton Beach 49980A coffee maker review. 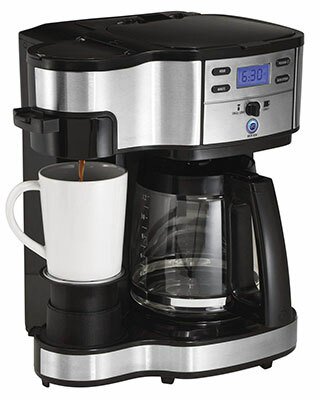 Even though the Hamilton Beach 48465 Coffee Maker has a 2 cup capacity, you can still get one fresh cup at a time. After all, you just need to press the dispensing bar with your cup and you’ll be ready to start a new day. In case you are the type of people who like to have a freshly brewed coffee as soon as you wake up, you can have so with the Hamilton Beach 48465 Coffee Maker. 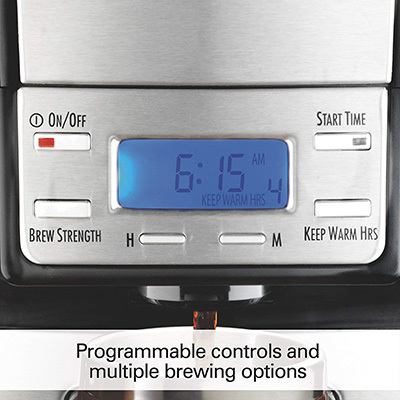 The truth is that the Hamilton Beach 48465 Coffee Maker allows you to program it with 24 hours in advance. Choosing the best coffee machine is never an easy task. After all, you just want to get a good cup of coffee every single time. However, with such a wide variety of coffee machine brands and models, you may have a hard time choosing the best one for you. The truth is that we can say that there isn’t just one coffee machine that is the best one for everyone. The reality is that you may prefer espressos but you may sometimes like to enjoy a latte or a cappuccino, or you may simply want an espresso machine. Then, you need to think about if this coffee machine will only serve you or other family members as well. And these make your choice a lot harder. 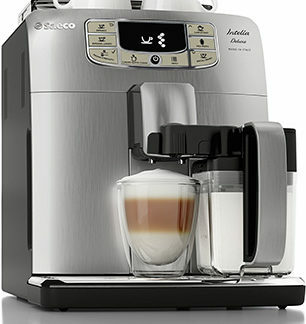 So, today, we want to talk to you about a coffee machine that we particularly like – the Saeco Intelia Deluxe. Featuring a beautiful style made of stainless steel that fits most kitchens, the Saeco Intelia Deluxe now includes a stainless steel milk carafe that was upgraded from a plastic handle. One of the things that we like about the Saeco Intelia Deluxe design is that both the dump box and the water tank are accessible from the front. While you may need to have some space to clean up the machine from time to time on the side, we are quite happy with the Saeco Intelia Deluxe. Discover the best semi automatic espresso machines. As you look at the Saeco Intelia Deluxe, the digital display menu will immediately catch your attention. However, we have to say that this display is a lot more than just beautiful; it is easy to operate as well. The names and buttons are all intuitive. So, even if this is your first coffee machine, you shouldn’t have any problems using it even if you don’t read the manual. One of the things that we like about this display is that it will also alert you. For example, when the water tank needs to be filled or the dump box isn’t in its place, the Saeco Intelia Deluxe will alert you. These are the top espresso machines on the market. So, what about the coffee quality? The truth is that the Saeco Intelia Deluxe coffee quality is incredible. This machine doesn’t only allow you a complete customization according to your personal preferences and tastes as the temperature is simply perfect. 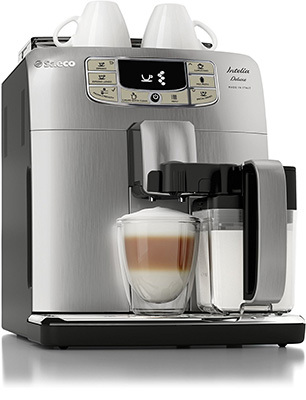 The reality is that no matter if you prefer your coffee strong or weak, the Saeco Intelia Deluxe delivers. After all, you can easily choose between the five dosage levels as well as from the 10 different grinder settings. Take a look at the best Vietnamese coffee brands on the market. As you can see, the Saeco Intelia Deluxe is a great machine that is able to deliver a good cup of coffee every single time. After all, you can easily choose the type of grind and dosage level that you want according to your personal preferences. Besides, the temperature is optimal. The Saeco Intelia Deluxe also features a beautiful stainless steel design that will look good in any kitchen. In addition, with the water tank and dump box accessible from the front, you can easily fit it in between your microwave and fridge, for example, saving you a lot of space. 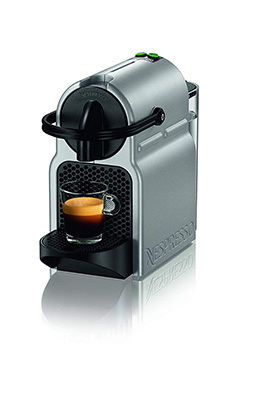 We have no doubts that one of the most popular coffee machine brands is Nespresso. After all, they were one of the first brands that appear on the market offering coffee capsules. While you may be a lover of coffee, you sometimes don’t have the time to brew a cup of coffee. Or you simply don’t feel like it. So, a Nespresso is always a good coffee machine to have at home. But which one? 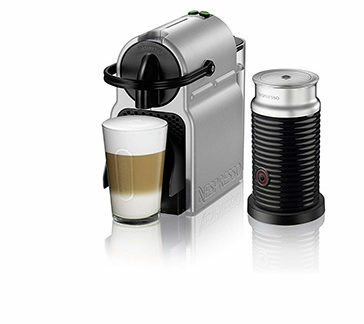 With such a wide range of machines, we decided to write a Nespresso Inissia review. The truth is that this is one of their most popular models. 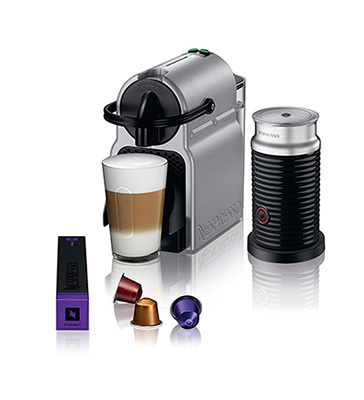 Featuring a compact and light design, the Nespresso Inissia is suited for both large and small kitchens. In addition, you can even pick the color that you prefer to ensure that it matches with the rest of the kitchen’s decor. Before we start with the actual Nespresso Inissia review, it is important to say that this is considered by many as the entry point to Nespresso. After all, it is quite affordable and allows you to take a look at what you can expect from the Nespresso pod coffee system. Even though the Nespresso Inissia is quite small, the truth is that it is still able to handle a 700ml water tank which is pretty incredible. Along with it, you will also easily access the perforated removable drip tray that serves to handle the used pods. Discover the best espresso machines. One of the things that we really like about the Nespresso Inissia are the controls. The truth is that this coffee machine only includes two buttons – one for the single espresso shot and the other one for longer lungo cup of coffee. As soon as you turn on the Nespresso Inissia, the lights will immediately flash and as soon as the water is at the right temperature, the buttons will turn green. So, you can be sure that even if it is dark and you don’t want to turn on the lights, you don’t have to. Take a look at the top latte machines. 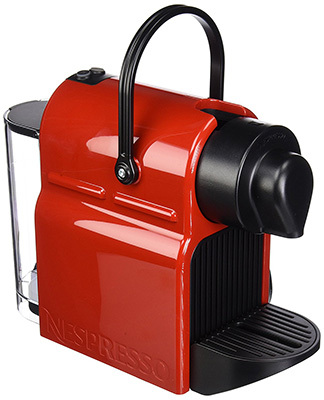 The Nespresso Inissia also includes a handle. Even though you may assume it is part of the design, the reality is that it has a function. As soon as you pull the handle up, the capsule caddy will open. So, you just need to put the capsule inside, clamp the handle down, and you’re ready to make your cup of coffee. In terms of the coffee quality, you can expect to get a true Nespresso coffee just like with any of other Nespresso coffee machines. You will get a delicious espresso with a full and rich crema every single time. Are you looking for the best Nespresso capsules and pods? 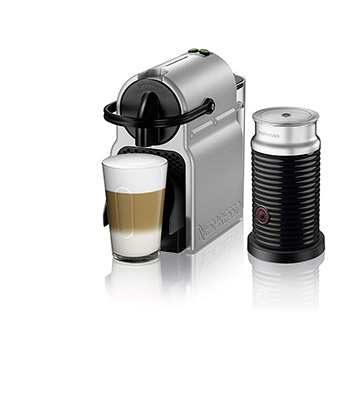 In case you are looking to buy a Nespresso and you believe your budget is too low, the Nespresso Inissia is definitely worth to consider. As one of the most affordable Nespresso machines, the truth is that it delivers a high-quality espresso both in short and long forms. In addition, the Nespresso Inissia is available in a wide range of colors and due to their compact size and being lightweight, the Nespresso Inissia is perfect for all kitchens, no matter how big or small they are. When you are looking for a good coffee makes, you probably already know that there are a lot of great brands on the market. While some coffee enthusiasts prefer to look at some specific brands only, others like to see the best they can buy within their budgets. Discover the ultimate guide to make an expresso. Today, we decided to write our own unbiased Hamilton Beach Flexbrew review. The truth is that the Hamilton Beach Flexbrew is one of the most popular coffee makers and we wanted to figure out if there are any reasons for this popularity or not. To start with our Hamilton Beach Flexbrew review, we have to say that one of the things that first caught our attention was the fact that the Hamilton Beach Flexbrew includes two ways to brew, making it a very flexible machine. 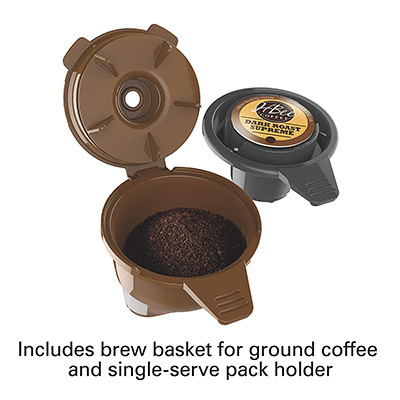 So, you can either brew a full pot of coffee using your preferred coffee grounds on the carafe side or you may prefer to just get one single serve. 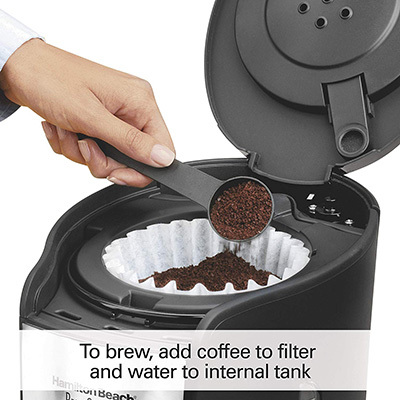 In this second side of the Hamilton Beach Flexbrew, you can actually use both coffee grounds as well as Keurig K-Cup packs. Still looking at the single serve side of the Hamilton Beach Flexbrew, it is important to notice that you can easily adjust the cup rest. So, this means that it won’t matter if you use a regular cup or a taller mug. They will both fit perfectly. Discover the best hand coffee grinders. On the carafe side of the Hamilton Beach Flexbrew, you will be able to get a 12-cup carafe each time. One of the things that you will immediately notice are the controls. The truth is that they are incredibly intuitive and you shouldn’t have any problems using them. After all, the Hamilton Beach Flexbrew controls are the same ones that you can find on other coffee makers. These include the auto Pause and serve, the programmable timer, and the 2-hour shuttoff. Take a look at the best grind and brew coffee makers. 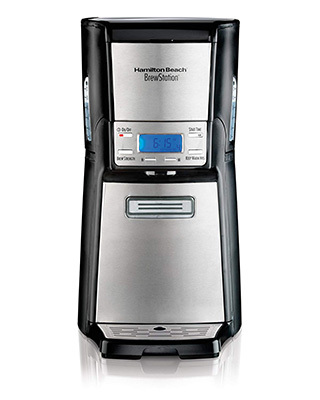 As we already mentioned above, in our opinion, the Hamilton Beach Flexbrew is very flexible and versatile. 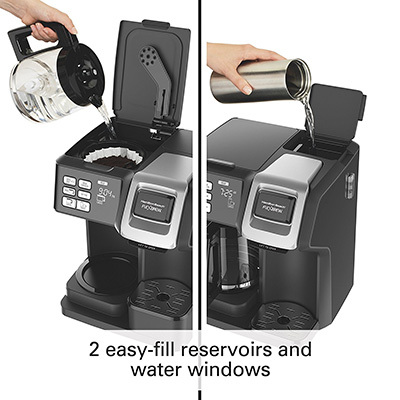 One of the reasons why we are saying this is the fact that the Hamilton Beach Flexbrew includes two different water reservoirs, one for each side. 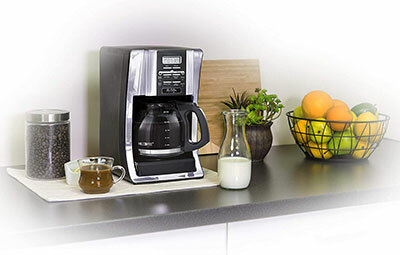 In addition, the carafe side of the Hamilton Beach Flexbrew allows you to get your coffee the way you like. After all, you can easily choose between regular or bold, in terms of the brewing strength. So, is the Hamilton Beach Flexbrew a good option for you or not? The truth is that we are extremely impressed with the quality of this coffee machine. The reality is that the Hamilton Beach Flexbrew Review doesn’t only have a beautiful design that will fit well into most kitchens as it allows you to make just one cup of coffee or a 12-cup carafe. Are you looking for a drip coffee maker machine? While there are some coffee machines that also allow you to do this, the fact that the Hamilton Beach Flexbrew Review includes two separate areas for the different servings make it completely different for the better. In terms of cleaning, you don’t need to worry about the Hamilton Beach Flexbrew Review. 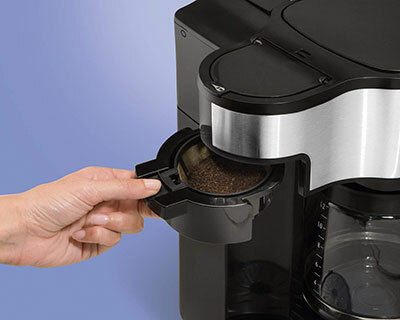 The truth is that the Hamilton Beach Flexbrew Review comes with a pod-piercing assembly tool that you can use to prevent any clogging that can occur when you use this amazing coffee machine too much. When you are searching for a good coffee machine and you only want to look at the most well-known brands, you should definitely consider taking a deeper look at the Mr. Coffee machines. With a lot of fans, this brand has been around for many years and usually, all their coffee machines have a lot of great feedback from users. And the best part is that they tend to be quite affordable especially for the quality they deliver. One of the best coffee machines from this brand in 2018 is the Mr. Coffee 12-Cup Programmable Coffee Maker. So, let’s take a closer look to see what you can expect from it. With a beautiful design that will look well on all kitchens, the Mr. Coffee 12-Cup Programmable Coffee Maker is a great coffee machine. 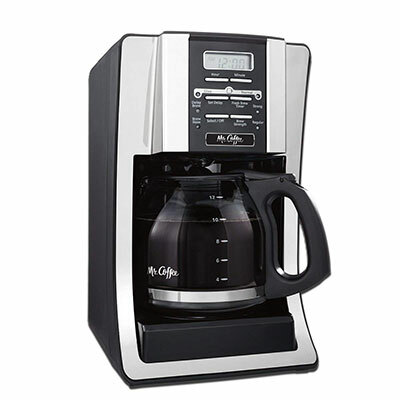 One of the things that we really like about the Mr. Coffee 12-Cup Programmable Coffee Maker is the fact that it comes with a water filtration system that will allow you to get a good cup of coffee every single day without that awkward taste. In case you are a coffee fan, you know exactly what we are talking about and you can rest assured that this won’t happen with the Mr. Coffee 12-Cup Programmable Coffee Maker. 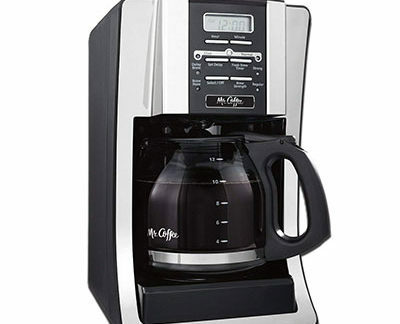 One of the features that keep being mentioned by the many people who are already using the Mr. Coffee 12-Cup Programmable Coffee Maker is the brew. 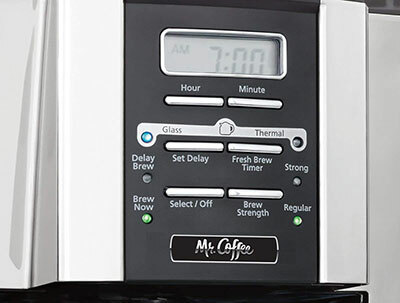 The truth is that you can schedule the Mr. Coffee 12-Cup Programmable Coffee Maker to brew the coffee ahead of time. This will allow you to get up in the morning without any rush and take the time to drink an amazing and fresh cup of coffee. But this is not all. The truth is that with the Mr. Coffee 12-Cup Programmable Coffee Maker, you can also choose the strength of your coffee. o, no matter if you prefer a regular cup or a bolder one right in the morning or in the afternoon, you can easily select it on the controls. Are you looking for a semi automatic Espresso machine? The truth is that sometimes you are in a hurry and you just can’t wait for the coffee to finish brewing. So, will you get out of the house without your morning cup? Not even close. 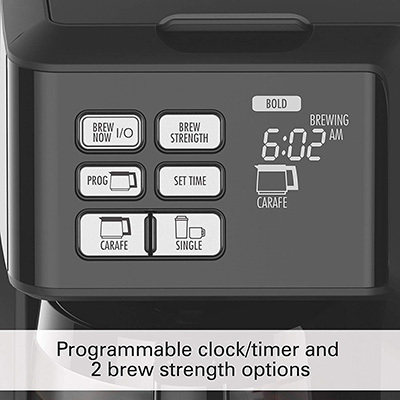 All you need to do is to pause the brewing process, serve your coffee into a mug or cup, and then let the Mr. Coffee 12-Cup Programmable Coffee Maker brew the rest of the coffee at its own pace. It’s as simple as that. One of the main concerns that many coffee lovers have when they are about to buy a new coffee machine is about the cleaning process. 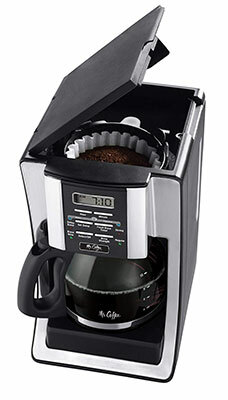 And the Mr. Coffee 12-Cup Programmable Coffee Maker has made your life very easy. After all, you just need to lift and clean the filter basket. And this won’t even take you 5 minutes. If you are like most people, you like to drink your coffee hot. So, the Mr. Coffee 12-Cup Programmable Coffee Maker will conserve your amazing coffee hot for about 2 hours without changing its flavor. When you are looking for a coffee machine that is able to deliver a good cup of coffee every single time, with the same great flavor, you need to know that you have some option on the market. However, we also understand that not everyone can afford to pay for an expensive coffee machine. So, today, we decided to take a closer look at the Cuisinart DCC-3400 12-Cup Programmable Thermal Coffeemaker. One of the reasons that made us tell you about the Cuisinart DCC-3400 12-Cup Programmable Thermal Coffeemaker is the fact that this is an excellent coffee machine that doesn’t sacrifice the flavor or the brew and that, at the same time, is extremely easy to operate. So, this makes the Cuisinart DCC-3400 12-Cup Programmable Thermal Coffeemaker one of the best coffee machines you can have if you are always on the go. How to get a good cup of coffee every single time? Featuring a beautiful and modern design that will look good in any kitchen, the Cuisinart DCC-3400 12-Cup Programmable Thermal Coffeemaker is very easy to use and very flexible. After all, you have the ability to control the flavor of the coffee between regular and bold, and you can even set this coffee machine to brew your coffee within the next 24 hours. So, if you need to wake up early in the morning and you want to save some time and have a great cup of coffee ready for you as soon as you get out of bed, the Cuisinart DCC-3400 12-Cup Programmable Thermal Coffeemaker is for you. 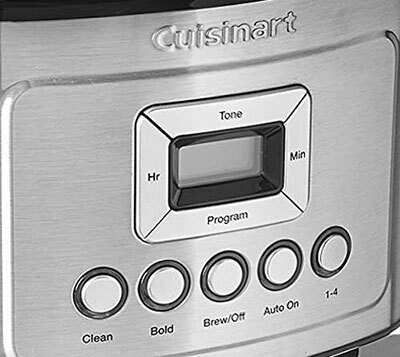 When your coffee is ready, the Cuisinart DCC-3400 12-Cup Programmable Thermal Coffeemaker will emit an alert. 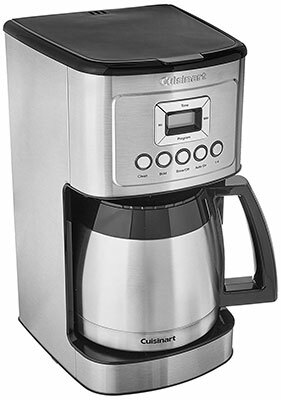 The Cuisinart DCC-3400 12-Cup Programmable Thermal Coffeemaker comes with a thermal 12-cup carafe that also maintains your coffee hot for 4 hours. And you can be sure that the flavor of the coffee won’t be altered in any way. Take a look at the best drip coffee maker machines in 2018. One of the things that we like about the Cuisinart DCC-3400 12-Cup Programmable Thermal Coffeemaker is the fact that the controls are extremely simple. They come with a bright blue LED lighting so you can see them in both the dark and light without any problems. 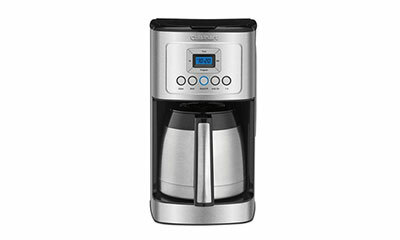 In addition, the Cuisinart DCC-3400 12-Cup Programmable Thermal Coffeemaker includes the on and off button, a 1-4 cup feature, and the circular button whenever you want to get a bold coffee. Since this coffee machine also allows you to set an alert, you can also turn it off in case you don’t want to bother anyone else on the house. If there is something we need to say that needs to be improved is the carafe itself. Besides the fact that we believe it could be less heavy, the truth is that you need to put it almost in a vertical position to be able to get the last part of the coffee in it. At this point, you may get yourself a bit dirty because of the splatters. 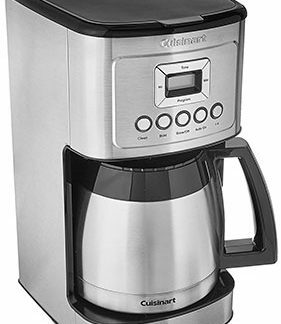 Overall, the Cuisinart DCC-3400 12-Cup Programmable Thermal Coffeemaker is a great coffee machine that delivers a good cup of coffee every single time. And while the carafe could be improved, the truth is that this coffee machine is durable and very affordable for what is able to deliver. When you are looking for a good coffee machine, you want to make sure that you get the best that the money you want to spend can buy. The reality is that there are a lot of great coffee machines for a wide range of prices. However, one thing is for sure – you don’t need to spend a huge amount of money in order to get a good cup of coffee every single time. So, when you are looking for a good coffee machine, you want to ensure that you do a good research before you actually buy one. With this in mind and with the goal to save you some time, we decided to take a closer look at one of the coffee machines that has a lot of positive feedback from users – the Hamilton Beach (49980A) Single Serve Coffee Maker and Coffee Pot Maker. The Hamilton Beach (49980A) Single Serve Coffee Maker and Coffee Pot Maker is a coffee machine that allows you to take 12 cups of coffee every single time. Nevertheless, you also have the option to take just a single-serve which is great. 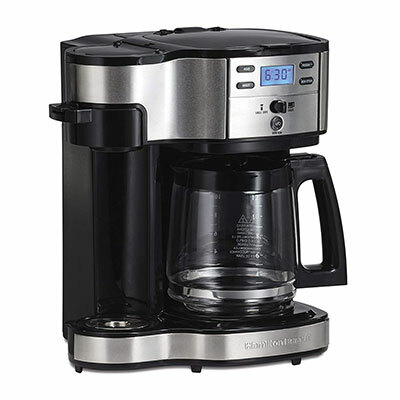 One of the things that we really like about the Hamilton Beach (49980A) Single Serve Coffee Maker and Coffee Pot Maker is the fact that this is a great coffee machine for every coffee lover. When you just want a good cup of coffee in the morning and you don’t want to lose a lot of time to know how all the controls of the machine work, the Hamilton Beach (49980A) Single Serve Coffee Maker and Coffee Pot Maker is perfect for you. 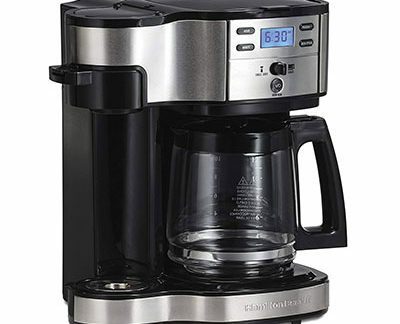 After all, all the controls on the Hamilton Beach (49980A) Single Serve Coffee Maker and Coffee Pot Maker are incredibly intuitive and easy to use and you won’t have any problems with any of them. When it is time to brew your coffee, you can easily choose the strength between regular or bold, according to your own preferences. Besides, you just need to decide if you want to brew your coffee using the 12-cup pot or if you just need a standard-size cup or travel mug. In this last case, you will only need to use the single-serve side. Discover the best Keurig coffee makers in 2018. 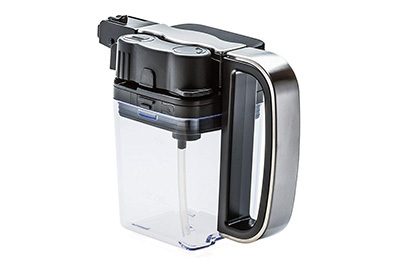 Along with the coffee machine, the Hamilton Beach (49980A) Single Serve Coffee Maker and Coffee Pot Maker also comes with the 12 cup glass carafe to ensure that your coffee is maintained hot and delicious, even if you don’t drink it all right away. 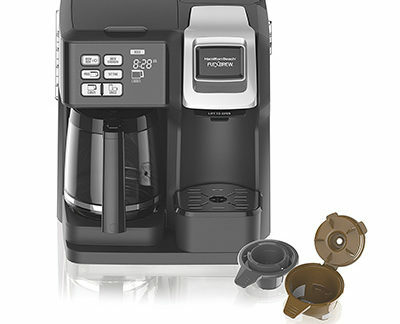 One of the main advantages of the Hamilton Beach (49980A) Single Serve Coffee Maker and Coffee Pot Maker that keep being mentioned by the happy users is the fact that you can either use coffee pods when you are in a hurry or you can simply use the coffee you prefer and brew it according to your own preferences. After all, the Hamilton Beach (49980A) Single Serve Coffee Maker and Coffee Pot Maker allows you to choose between a finer grind and get a richer flavor or you can go for a bold flavor. In case you are considering using pods, you need to know that the Hamilton Beach (49980A) Single Serve Coffee Maker and Coffee Pot Maker isn’t compatible with Keurig K-cups which are one of the most popular ones on the market.